Join the famous TV host in conversation! Why See A Conversation with Ellen Degeneres? Ellen Degeneres has been delighting audiences with her heartwarming and feel-good talk show, The Ellen DeGeneres Show, since 2003. 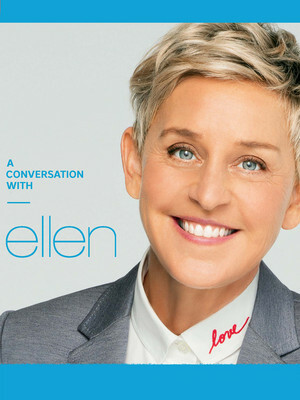 Comedian, TV personality and social rights advocate Ellen has become a household name with a mass following of dedicated fans, now join the infamous Ellen as she heads to Toronto and Montreal for an evening of intimate conversation! Ellen invites you into her inner world as she shares her inspirational story. From the highs to the lows, no subject will be left unturned as you discover what makes this international star tick. Winner of 59 Daytime Emmy Awards, Ellen is often applauded as someone who is not afraid to speak out. From covering topical stories and interviewing big celebrity guests Ellen often demonstrates her humanitarian side. Speaking out about injustices towards Women and the LGBTQ+ community the star is an avid supporter of diversity and inclusion and has found herself at the heart of the nation as one of the world's favorite TV personalities. Sound good to you? Share this page on social media and let your friends know about A Conversation with Ellen Degeneres at Centre Bell. Please note: All prices are listed in US Dollars (USD). The term Centre Bell and/or A Conversation with Ellen Degeneres as well as all associated graphics, logos, and/or other trademarks, tradenames or copyrights are the property of the Centre Bell and/or A Conversation with Ellen Degeneres and are used herein for factual descriptive purposes only. We are in no way associated with or authorized by the Centre Bell and/or A Conversation with Ellen Degeneres and neither that entity nor any of its affiliates have licensed or endorsed us to sell tickets, goods and or services in conjunction with their events.